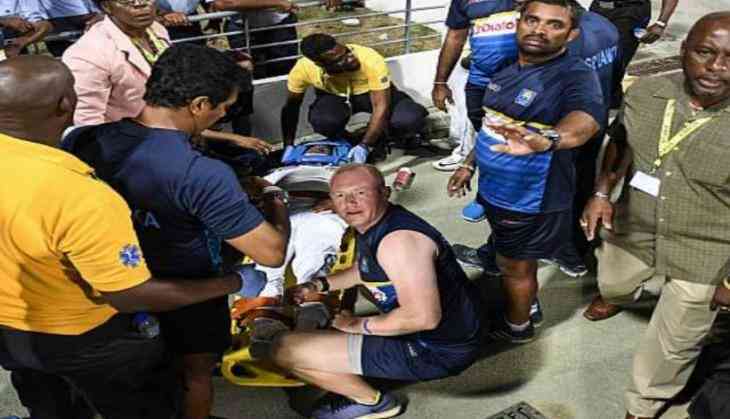 The 27-year-old Sri Lanka's top order batsman Kusal Perera met with an injury after crashing onto the advertising hoardings on the third day of the third day-night Test between West Indies and Sri Lanka in Barbados on Monday. According to reports in Cricbuzz, Perera is available to bat in the Lankan second innings if needed. "KJP was discharged from the hospital after scans cleared him. He went back to the ground. He has been cleared, but has been advised to rest. He will bat if required tomorrow," a Sri Lanka Cricket official said. SriLankan batsman Kusal Perera who has had a fair share of injuries in recent times is out of danger. The team manager of SriLanka took twitter “He is cleared of any serious injury, but we will have to wait and see, how he will come up tomorrow morning, before making a decision on whether to bat him or not." “He is cleared of any serious injury, but we will have to wait and see, how he will come up tomorrow morning, before making a decision on whether to bat him or not,” said Asanka Gurusinha, the Team Manager on #KJP. According to reports in Cricbuzz, Perera is available to bat in the Sri Lankan second innings if needed. "KJP was discharged from the hospital after scans cleared him. He went back to the ground. He has been cleared, but has been advised to rest. He will bat if required tomorrow," a Sri Lanka Cricket official said.